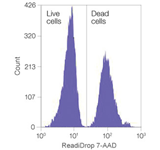 The ReadiDrop 7-aminoactinomycin D (7-AAD) cell viability dye is designed as a ready-to-use 7-AAD solution, to exclude dead cells in Flow Cytometry and Immunofluorescence Microscopy. 7-AAD enters a cell with a compromised membrane and binds to double-stranded DNA. This dye is available as a convenient ready-to-use solution: simply add 1 or 2 drops of the 7-AAD solution to assess the viability of your cells. Figure 2. Excitation and emission spectra of 7-AAD. 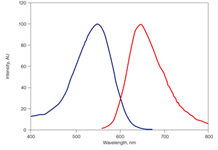 Maximal excitation is 546 nm (blue) and maximal emission is 647 nm (red). We also offer fixable cell viability dyes in a range of excitation and emission spectra to incorporate into multi-color Flow Cytometry panels.